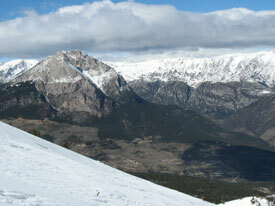 The Serra d'Ensija in the Alt Berguedà, is a zone of high interest located between the Pedraforca and els Rassos de Peguera. We propose to crown its higher summit, La Gallina Pelada of 2317 meters. It is an excursion without difficulty but with a considerable unevenness that is surpassed with strong slopes. 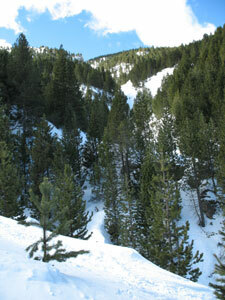 The exit we will do it from the zone of leisure of the "Pleta of the Vila" very near the ski resort of Saldes well-known like the Parc de neu readily accessible by a asphalted track that takes last the town of Saldes following the road Saldes to Gósol. Route: We initiated the walked at the parking located in the Pleta de la Vila. 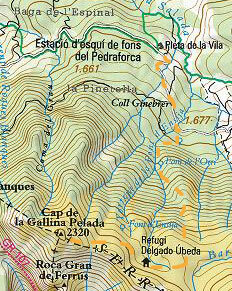 We took the track that comes from the Coll de la Trapa and that goes to Vallcebre until finding an indicator that marks to the beginning of the way towards the Font freda. We will continue raising by the precipice until arriving when coming out from the forest and finding the great meadows superior. 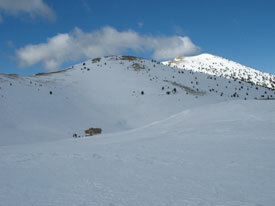 We will turn 90 degrees our course and we will walk in direction the west to arrive at the Refuge d'Ensija. We will continue in the same direction following the noticeable way and the indications that lead the Gallina Pelada where we will be able to enjoy magnificent views of the Pedraforca and the Cadí to the north, and els Rassos de Peguera the south. In direction this and if the day is clear we will see the bulk of the Montseny. We can make this walk in any time of the year. 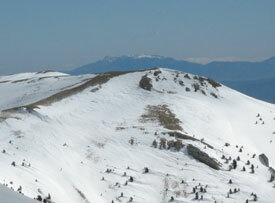 In winter season snow rackets can be rented in the Parc de neu. In summer it is possible to be had water in some of the diverse sources that normally are not dried.